This may be in the wrong area folks, if it is I apologize. My question is, how do YOU know how many times you've used a certain blade? Dice, numbered cup hook, only use blade once so no worries? Etc. Sometimes I forget and just toss the blade, need a solution. I only use blades once. Otherwise, I've just relied on memory in the past. I counted by marking on a notebook, along with soap use and some notes on razor experiences. Then got tired of that and I just use what I want to. Blades are used until they don't cut smoothly atg on my neck or the shave does not last as long (16 hour test). Dice is probably the best way to keep track. I only shave about 3 times during the work week so it is easy for me to start a blade on monday and use it for the last time on friday. Because of this I can more or less remember how many times I have used it. If for some reason I am completely unsure I just toss it and use a new blade. Lately I have been shaving with artist club blades and they last so long for me I completely forget how many shaves I have gotten out of one blade, and keep track of it does not really matter. So I just keep using it until the moment I can feel it pulling a little, then I just toss it on the spot and put in a fresh blade. (11-16-2017, 07:31 AM)JRRIII Wrote: Dice is probably the best way to keep track. I only shave about 3 times during the work week so it is easy for me to start a blade on monday and use it for the last time on friday. Because of this I can more or less remember how many times I have used it. If for some reason I am completely unsure I just toss it and use a new blade. Thanks for the replies guys. Sometimes I'll have several different brands of blades in rotation and it's gets hectic trying to remember the number of times I've used a certain blade. Duh! guess I need to stop that practice completely and just use one blade at a time till it's done. I'm a "three strikes and out" guy, blades are cheap enough to toss after three uses. I blame my son (easy way out), as he's the one that got me started rotating different blades and different razors. Too complicated. (11-16-2017, 07:18 AM)TheLegalRazor Wrote: I only use blades once. Otherwise, I've just relied on memory in the past. I stay with a single blade until it stops cutting efficiently. Generally that’s 3-5 shaves from a DE, 8-12 from a SE. But I don’t keep track, I just evaluate the blade after every use. (11-16-2017, 07:30 AM)lloydrm Wrote: I counted by marking on a notebook, along with soap use and some notes on razor experiences. Then got tired of that and I just use what I want to. Blades are used until they don't cut smoothly atg on my neck or the shave does not last as long (16 hour test). 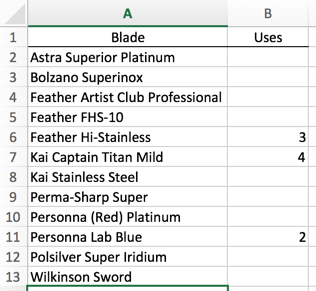 This spreadsheet helps me keep track when I have multiple blades going at the same time and, very important for me, it also provides an accurate number of uses on a blade for my SOTD postings. With DE, I just use a Sharpie marker and cross out the 1,2,3,4 in the corners. What else would the number be there for? Generally with most blades, it’s two shaves and done. It’s pretty easy to keep track of that. As I usually have several blades in rotation, I use dices to count usage. My den is an old farmacy cabinet made of steel and glas. I use rubber coated magets to hold the blades on the back wall of the cabinet and the dices are placed in front showing the number of uses on the top face. The magnets are about 15 mm in diameter and 3 mm high. The rubber coating prevents from any form of corrosion on magnet, blade and steel back wall of cabinet. (11-18-2017, 12:45 AM)motto Wrote: As I usually have several blades in rotation, I use dices to count usage. My den is an old farmacy cabinet made of steel and glas. I use rubber coated magets to hold the blades on the back wall of the cabinet and the dices are placed in front showing the number of uses on the top face. The magnets are about 15 mm in diameter and 3 mm high. The rubber coating prevents from any form of corrosion on magnet, blade and steel back wall of cabinet. Wow, Marco! You keep a lot of blades in rotation. Very interesting. I have settled on two uses of each blade. I have fixed razor rotation and 1 dice works well normally. I try for 5-6 shaves with some blades better than others. I clean and change blades at the same time for all razors. The Shaving Buddy App. I log the shave, it keeps the count. I use DEs about 5-6 times, so the weekends end up being a good milestone marker for me. SE blades get used longer, but I don't really keep track of them. If my last shave started to feel a bit dicey, then I know I need to change the blade the next morning. I normally get 4-5 shaves from a blade. I don't really pay attention to the number of uses. When the shave starts to degrade, i swap blades.